Lee Garden One to Six is a tree-lined oasis in Causeway Bay, at the heart of Hong Kong Island. It is renowned for its elegance and refinement. The elegant architecture, complemented by creative use of open spaces, provides a uniquely relaxing ambience for shoppers and diners. Lee Garden One to Six is home to an unrivalled concentration of top international designer shops and houses some of the city's most sought-after restaurants. Popular with Hong Kong's movers and shakers, it is the destination of choice for anyone with a taste for the best things in life. At Hysan Place, hipness is no longer just for the fashion elite. 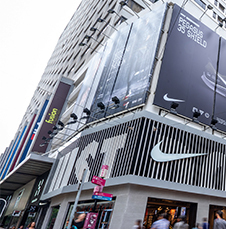 Located at the heart of Causeway Bay with direct access to the MTR station, Hysan Place showcases an enviable selection of nearly 120 most sought-after international brand boutiques spanning over 17 floors. It’s a place for you to hang out, have fun, and share unforgettable shopping experiences with your friends. Enjoy the generous high ceiling with open shop fronts, stroll along the atrium sprinkled with natural light via the huge central skylight, or linger at the Sky Garden with lush greenery. A window to all things hip from around the world, Hysan Place will turn your shopping trips into an endless fun journey of discovery each time and enable you to connect with your inner hipster. Hysan Place has been awarded LEED Platinum certification for Core and Shell by the U.S. Green Building Council (USGBC). It is the first LEED Platinum mixed use office and vertical mall complex in Greater China. 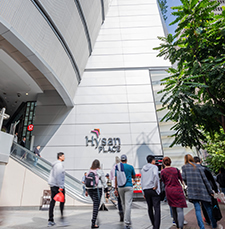 The LEED Platinum certification of Hysan Place is a testament to Hysan's commitment to a sustainable environment and energy efficiency. 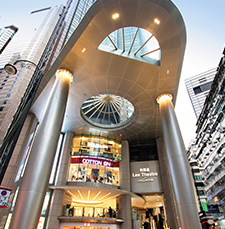 Lee Theatre is a Hong Kong landmark comprising 26 floors of retail space. It houses the world's most famous international lifestyle brands, fashion flagship stores, restaurants and beauty and fitness centres. The City's most unique shopping area is just a step away. An abundance of high-end fashion boutiques, discerning lifestyle stores, and cafés are yours to discover! 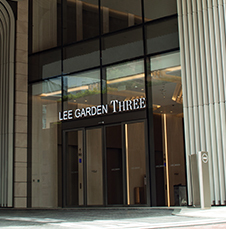 The Lee Gardens area is Causeway Bay's premium destination, offering first class business and retail facilities. As a magnet for exciting fashion, lifestyle products, hospitality and dining, Lee Gardens represents the heartbeat of Hong Kong. This high-energy zone truly stands among the most vital and dynamic journeys of discovery in the world, creating a choice location for people to work, shop and play.